SPA is proud to announce this week’s Noontime Act: Black Horse Motel! Black Horse Motel will be performing a FREE show at Noon on Friday, October 18th, in the Noontime Lounge (directly above Panda Sushi). As an added bonus, they will be sticking around, as the LateNight Act, to play another FREE show at 10pm in the HUB. Philadelphia-based Americana band, Black Horse Motel, conjures a sound that draws on traditional folk roots, along with many other influences, and ties it together with unifying vocal harmonies. Their songs are built on the foundations of folk music, but are elevated by an infectious blend of the traditional banjo and mandolin, with guitars, strings, drums and vocals. The resulting sound is dexterous, rich, accessible and toe- tapping. In early April 2012, Black Horse Motel offered their first recording, in the form of a four-song self-titled EP. Their debut full-length LP, Red Summer Spirit, was released on March 1, 2013 to a sold-out crowd at Kung Fu Necktie in Philadelphia and is now available through many major online outlets. Enjoying the fruit of America’s neo-folk revival, Black Horse Motel has solidified itself as one of the East Coast’s most relevant folk bands. 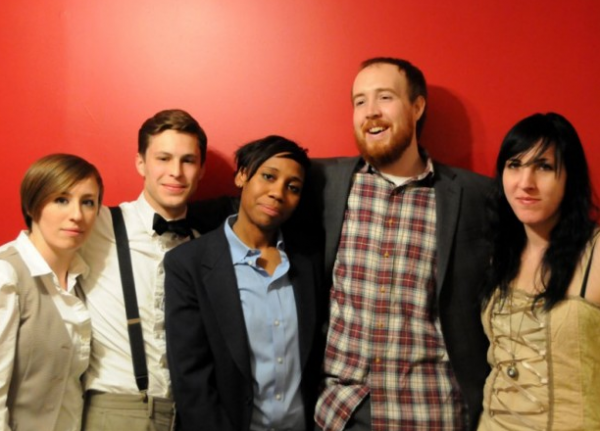 The group has performed at many of Philadelphia’s popular venues, including World Cafe Live, Kung Fu Necktie, Tin Angel, Milkboy (also located in Ardmore, PA), and Underground Arts. Undeterred by some lineup changes in the guitar and viola/violin spots, the group, now consisting of David Richardson, Megan Manning, Desiree Haney, and Galen Fitzpatrick, is looking to tour, record and expand their fan-base in 2014. Come start your weekend off on a good note with Black Horse Motel at Noon and again at 10pm!